There is sunshine in my kitchen today!!! 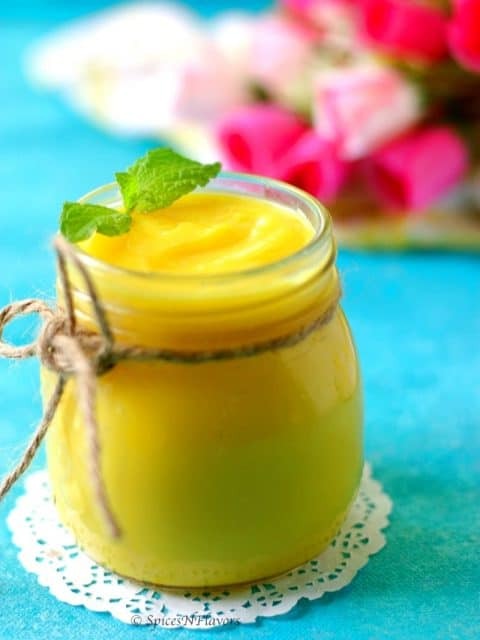 How to make lemon curd at home? Can lemon curd be made without eggs? How to tell when lemon curd is done and what to do when lemon curd won’t thicken? How is lemon curd used? Also, find many tips and tricks to help you make the best Curd that you would ever have. One more thing I am trying to cover as many details as possible. If I have left out anything please feel free to drop it in the comments section, I will try to update the post with the same. It is basically a type of custard made using of course lemons, eggs, butter and sugar. Just basic ingredients combined to form a smooth base which can be used as a dessert spread or as a topping. Find the numerous ways in which you can use this further in the post. So is lemon curd a custard or is lemon curd a jam? Ideally, it is neither but is used as an alternative to both. How to make lemon curd from scratch? Making lemon curd is fairly easy. Yes, it takes a bit of technique here but with these few pointers that I am sharing it would be easy for you to get it right in the first attempt. Keep all the things handy and ready near you – like butter, a bowl, a sieve and a whisk. Always cube your butter to small pieces because we need to add little at a time so comes super handy. Start adding butter once you do the finger test. You have to start adding your butter cubes little at a time once the egg and sugar mixture is warm to touch. How do you know that it is warm? Simple!! Using clean hands, insert your pinky finger into the mixture and check if it is warm to touch. That is a simple Finger Test which you can use to check and then start adding butter and cook until the mixture thickens. But, how long do you have to cook Lemon Curd for? So how do you know your lemon curd has thickened? What I follow is, upon continuous whisking, at one point you will observe that the egg, sugar and juice mixture starts boiling. So when you see the first boil, start counting 1 to 50 in your mind. When you reach 50, take it off the flame, pass it through a sieve, cling wrap and let it sit in the refrigerator until thickened. This one trick has always helped me. Do try it once and share your experience with me. Will lemon curd thicken as it cools? Yes definitely. In fact, that is one of the major and important points to note which is to chill it in the refrigerator which thickens it further. When you are making the stove-top version, you need to whisk it continuously, keep a tab on your gas flame, do the finger test and also keep counting to get that perfect lemon curd which sometimes does not behave like you want to..
Lol.. I meant even after utmost care sometimes you will end up with scrambled eggs or sometimes the curd just won’t thicken. Why lemon curd won’t thicken and how to fix it? This issue arises when the liquid measurement is off in the recipe. To avoid this or to fix the issue all you need to do is add an extra egg yolk to your mixture and follow the remaining steps. Yes by any reason if your lemon curd does not thicken then simply try adding an additional yolk to it. I have tried it personally. Well, some of you might be thinking that is too much technical stuff going on there.. Not really once you understand the basic diametric you would never go wrong in creating and trying recipes that you like. But if you wish it were simpler and you get perfect results each time, then my friend you need an INSTANT POT in your life. Instant Pot Lemon Curd – perfect results each time!!! By now you got a gist of things that you need to take care while making that perfect Lemon Curd. What if I say you can make the best ever lemon curd with perfect results each time without having to worry about all the things that I just mentioned above. No stirring.. no babysitting.. no monitoring..
Super easy and convenient to make. This method is so simple that literally, anyone can make it. All you have to do is pulse all the ingredients together in a mixer or food processor and then add it to a jar and into your instant pot. That’s it. 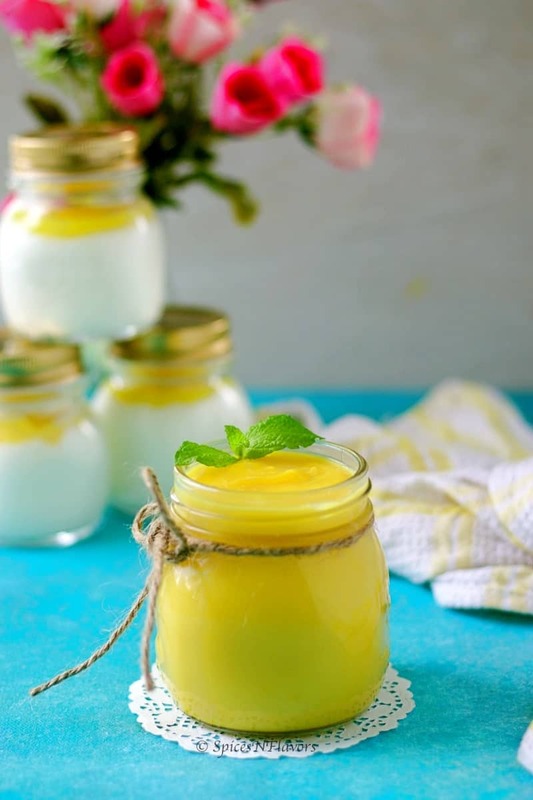 How to make Lemon Curd without eggs? 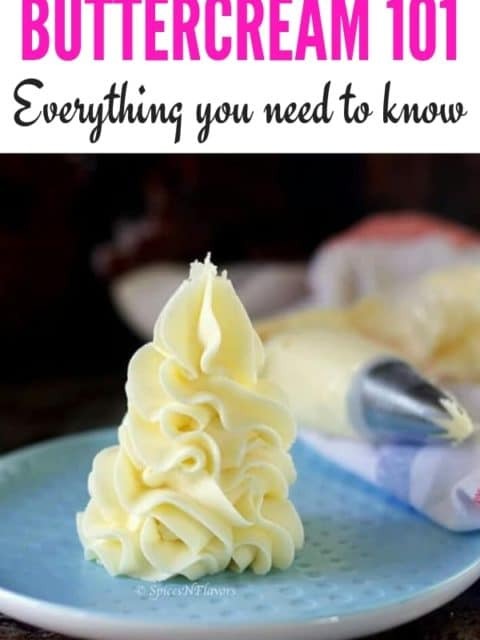 I understand a lot of you who follow me on my Youtube Channel, try to avoid baking with eggs so this section is just for you. Condensed Milk: which gives it that silky smooth and falling off from the spoon look. Yes, you read it right. Turmeric lends it that beautiful yellow colour without actually rendering its taste. In fact, it is super easy to make the eggless version as compared to the usual ones that are made using eggs. Find the exact procedure in the recipe card. 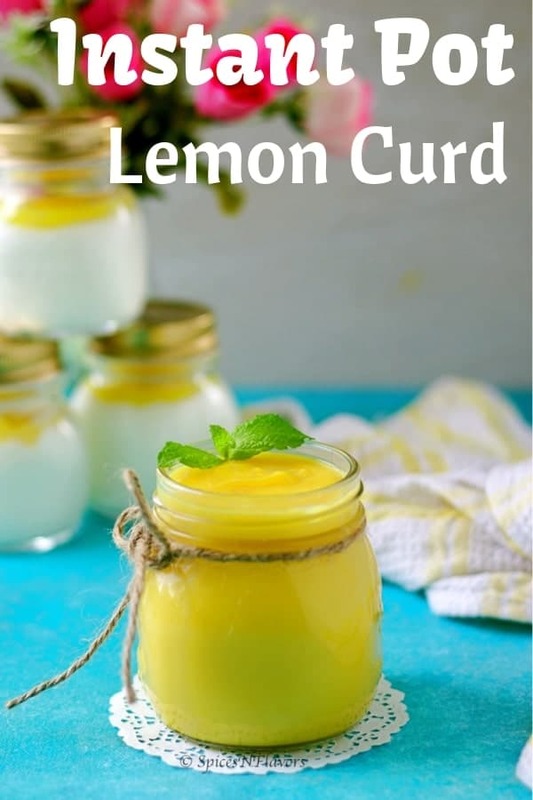 Now that you have made the most amazing Lemon Curd let me share few recipes which use lemon curd. I had to start with this. Instant Pot Cheesecake is all the rage now!! So a lemon curd cheesecake would just be so cool. I do not have the recipe for the same yet but you can take my basic instant pot cheesecake recipe and add some lemon curd to it instead of peppermint essence and try that if you like. Yes, this is the recipe that I shot when I made the lemon curd, so lemon curd tartlets will surely make it to the blog. This is a classic Kiwi and Australian dessert. This is sooooooooo good that I insist you have to try it at least once in your lifetime. 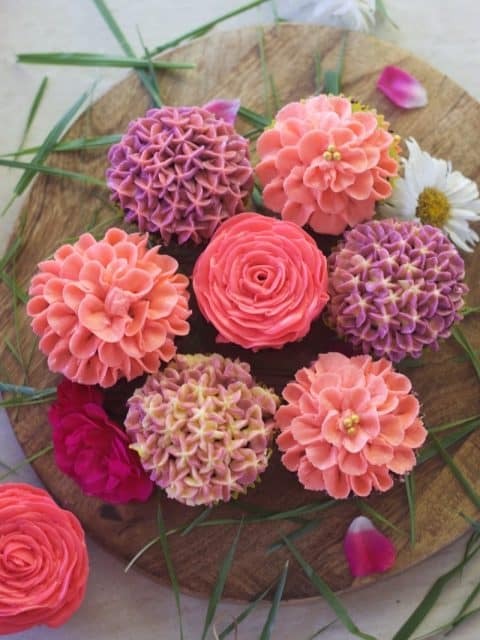 Bake a simple or a regular cupcake by adding lemon zest to your usual cake batter. Fill it with lemon curd and top it with lemon frosting. How to put lemon curd inside cupcakes? I have the recipe for strawberry filled cupcakes you can follow that procedure but use lemon curd instead of strawberry compote. Simply fold in lemon curd to softly whipped cream to get a delicious mousse for you to enjoy. I know some of you are wondering, can lemon curd be mixed with whipped cream? Start by whipping your cream and sugar. Once you whip it to soft peaks stage add in the lemon curd and fold until it is combined. Chill overnight and you have the perfect mousse ready. Out of all the above, this has to be my favourite. And you won’t believe how easy and fun this is!! 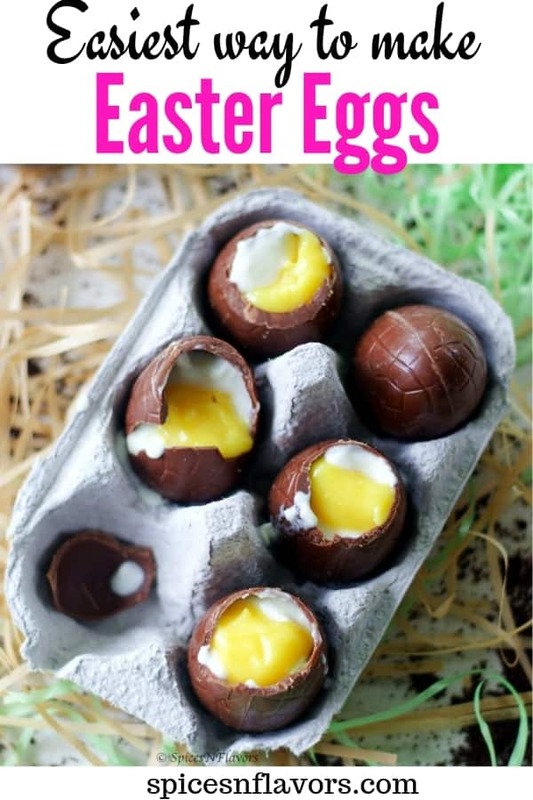 All you have to do is buy some chocolate Easter eggs from the market. It can be used in many other ways like simply top it on some yoghurt for an after-school snack idea, spread it over bread or scones like a jam, fill it in strawberries. Lemon Curd fillings taste awesome when layered in a cake. Other than these it can also be used as a filling for the macaron, panacotta etc. Now let me address a few of the questions that I see popping up on Facebook all the time. What kind of lemons to use for making a lemon curd? Now I know it is expensive and not available year round. In that case in the following recipe increase the amount of sugar to 3/4 cups to balance out the tartness of other lemon juice. Can I use bottled lemon juice for making lemon curd? Yes, you can. But it won’t taste as good as the ones made using fresh ones. So I would recommend you guys to take half and half. That is half fresh lemon juice and half bottled. Also, add lemon zest to the curd to get that oomph factor. Can you pipe lemon curd? Yes, you can once thicken. But of course, do now expect it to pipe like a cupcake frosting. 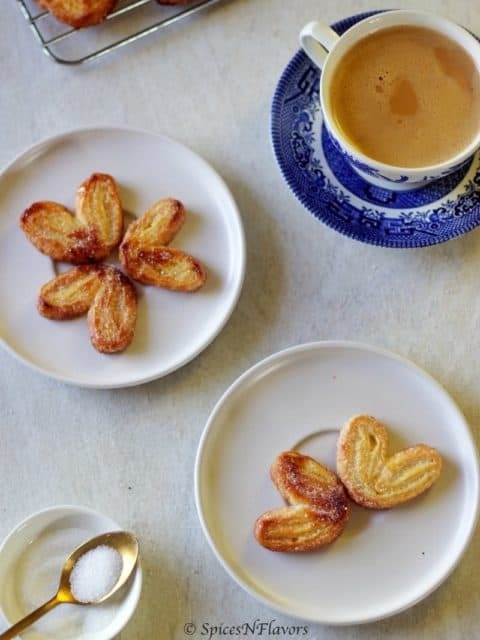 Check out the lemon friands recipe and you will get an idea. What to do with leftover lemon curd and cake scraps? 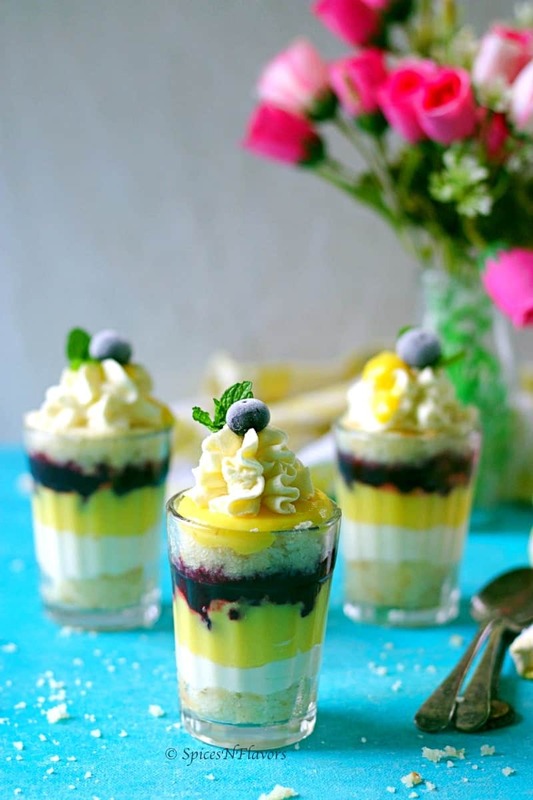 Haha.. Definitely make lemon and blueberry Trifle.. This tasted so heavenly. Pretty basic recipe – Layers of soft and spongy eggless vanilla cake, softly whipped cream followed by instant pot lemon curd and blueberry compote is an explosion of flavours. 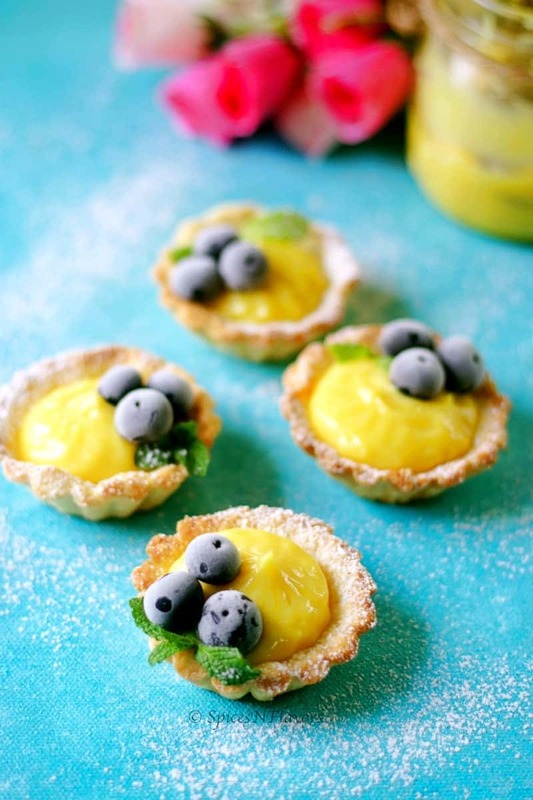 The tart lemon curd and sweet blueberries are a perfect party or potluck dessert idea. Check my Youtube video for a detailed step by step recipe. Does lemon curd freeze well? Yes, it does freeze well. Cool it completely before transferring it to a freezer-safe container. This can be frozen and preserved for up to 6 months. Can lemon curd be made ahead? Yes since this freezes well, you can make it ahead of time and use as and when needed. 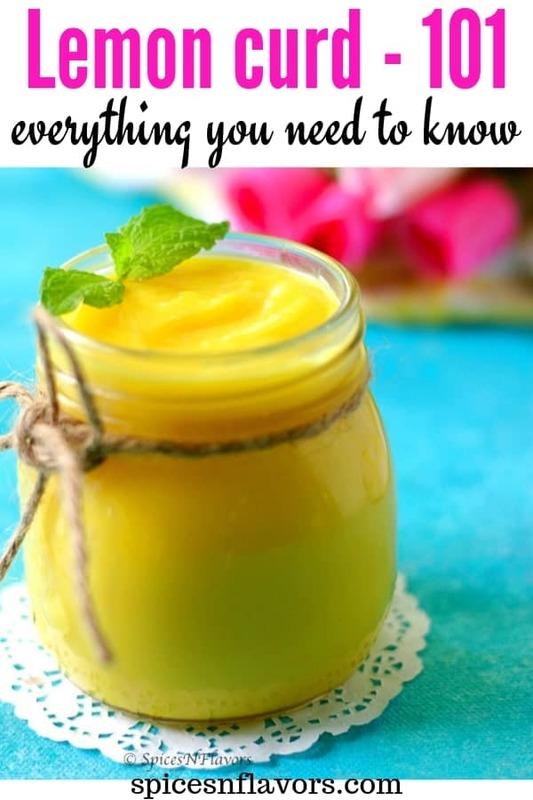 Find all the tips and notes that you need to make the best lemon curd recipe. 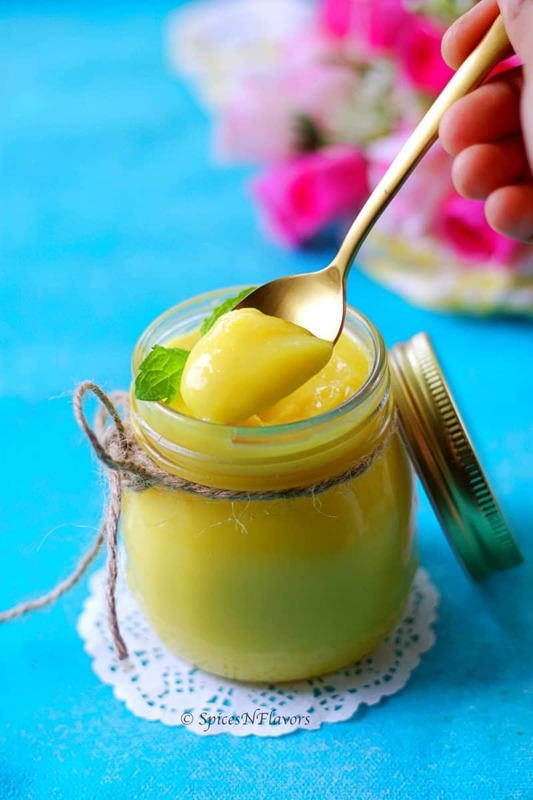 This homemade lemon curd recipe can be used to make many desserts like macarons, puff pastry, cheesecake, tartlets, mousse, frosting, pavlova, crepes, trifle, layering, filling and frosting buttercream cake. Whisk together the juice, zest, eggs and sugar in the pot until warm to touch on a med-low flame. Add the cubed butter a little at a time whilst whisking gently but continuously until thickened. Cling wrap and refrigerate the lemon curd until ready to use. In a mixer or blender add all the ingredients except for lemon zest. Pour 2 glasses of water to the base of your IP. Place the trivet and then the ramekins. Close the lid. Vent to sealing position. Pressure cook or Manual mode for 8 mins. Allow natural pressure releasing. Once the vent drops down. Take the jars or ramekins out. Using a spoon just mix the lemon curd until smooth and lump free. Chill the lemon curd in the refrigerator to thicken further. Meanwhile, prepare the slurry - Mix together cornflour and water to make a slurry. Once the lemon juice comes to a boil, add this cornflour slurry and mix everything until it thickens. Transfer it a bowl. Add in the condensed milk and whisk until smooth. Chill in the refrigerator to thicken further. This makes 3/4 cups of lemon curd. 1. Please refer the above paragraphs to know the tips to make the perfect lemon curd. 2. This recipe yields a tart lemon curd unless you use Meyer lemons. If you cannot lay your hands on Meyer lemons and would prefer a sweeter lemon curd then just increase the quantity of sugar to 3/4 cups. 3. 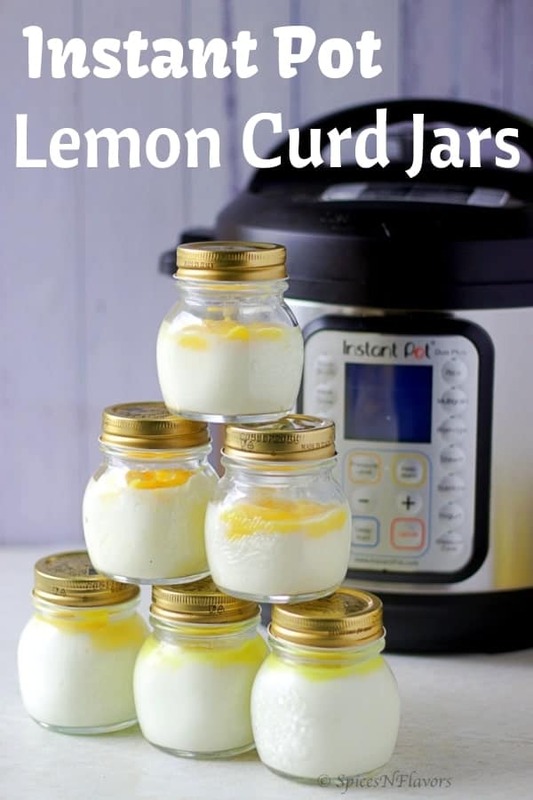 While making Instant Pot Lemon Curd when you blend the butter, sugar, lemon juice and eggs in a mixer or blender it may appear split or curdled. But do not panic, just proceed with the recipe and you will get it right. 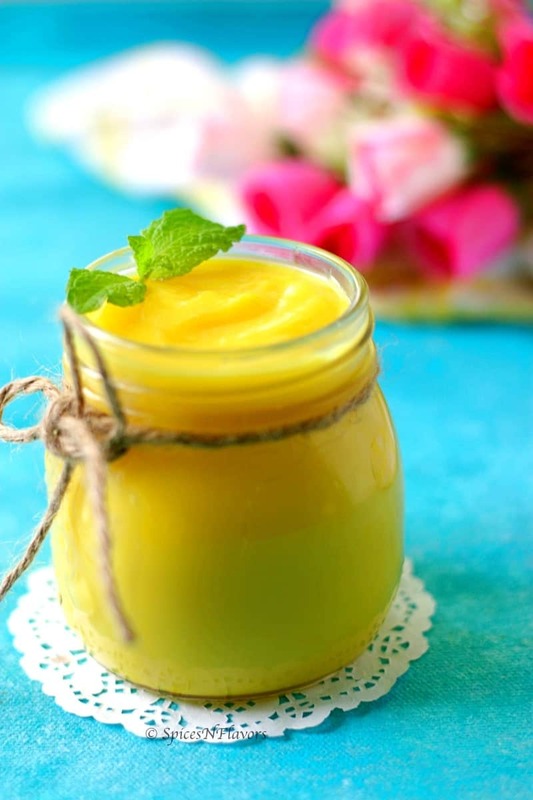 This Lemon Curd recipe makes a really tart, smooth and silky fruit curd. It is advisable to use Meyer Lemons only. However, if you cannot find one then increase the quantity of sugar to 3/4 cup to balance the tartness of the juice. Making in an Instant-Pot is really an easier and convenient method. There are so many ways in which you can make use of this lemon curd. Let me know which one is your favourite. If you ever try this recipe then do let me know by tagging me, tweeting me or Instagram me. I would love to follow you and your posts. Yay!! thank you for sharing your amazing feedback on this.. As I really worked hard to pen down everything and when you acknowledge that.. nothing like it.. so good to know that all this information was helpful.. I hope you try one of the ways soon and share your thoughts then too.